~ How to lead and manage people; powerful tips and strategies to motivate and inspire your people to bring out the best in them. Be the boss people want to give 200 percent for. ~ How to improve your personal effectiveness; save hours of time with these practical tips and techniques for organizing your time and workload. ~ Tips to improve your planning abilities; think ahead to get ahead. ~ How to develop yourself; simple to follow self development tips and strategies. ~ How to set and achieve goals. ~ How to better manage yourself; tips and tactics to unleash your hidden potential. ~ How to make the right decisions; an effective 7-step decision making formula that will help you make decisions with unshakable confidence even when you're still not sure. It's easy and really works! ~ How to handle stress the easy way; eleven sure-fire ways to make the stress in your life work for you instead of against you. ~ How to solve problems; as a manager you deal with problems and crisis situations on an almost daily basis. As a matter of fact the way you handle such situations can make or break you. Here's an effective, easy to implement 9 step strategy that will help you solve problems like magic. ~ How to conduct successful meetings the easy way. 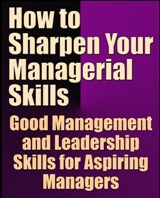 ~ All these and much much more effective management skills pdf. In organizations we must work with and for others. To be able to mutually achieve our goals we must be able to relate to others effectively. These Effective Leadership Skills Training tips will help you do just that. -- Catch people doing things right and then let them know that they are doing things right. -- Use feedback to stay informed about what other people are doing in your area of responsibility and authority. -- Have regular, focused meetings regarding the projects that you are responsible for. -- Provide adequate instructions. Time is lost if things are not done correctly. -- Train others to do jobs. You cannot do them all, nor can others do them if they have not been trained. -- Expect others to succeed. It becomes a self-fulfilling prophecy when you believe others are loyal, dedicated and doing a good job. -- Help others see how they will benefit from doing a job. This is when they truly become motivated. -- Do not avoid talking to a poor performer. It hurts them, the organization and yourself if the situation is not dealt with. -- Do not over control others. It is frustrating for them and time consuming for you. -- Focus on results, not on activities or personalities. -- Reward people for the results that they produce. -- Manage by walking around. See what people are doing and listen to what they have to say. -- Make quality an obsession, especially on smaller items. Send thank you notes and memos. -- Provide workers with open, direct, and immediate feedback on their actual performance as compared to expected performance and they tend to correct their own deficiencies. -- Practice naive listening. Don't talk, just let people explain why they are doing the types of things that they are doing. You will learn many things. Manage by exception. When things are going well, leave them alone. When a problem occurs, then help. -- Never seek to place blame. Always focus on the problem. -- Never ignore a concern of one of your people. While it may seem trivial to you, to the other person it is a problem that will continue to destroy their train of thought. -- Make it a personal rule and a challenge to respond to someone within 24 hours of hearing their request. -- Keep memos on bulletin boards to a minimum. People will spend less time standing there reading. -- Give employees an opportunity to speak their opinions and suggestions without fear of ridicule or reprisal. -- When you are going to make a change that affects others, get them involved before making the actual change. This increases commitment to make the change work after it is implemented. -- Put key ideas on small posters to hang around the office. -- When the environment and your sincerity permit, give the person a hug or a touch. -- Employees are the only organization resource that can, with training, appreciate in value. All other resources depreciate. -- People want to be involved in something important. Give them a whole project or a significant piece of the project to work on. -- Have salary tied into performance appraisal and accomplishing of objectives. -- Consider sharing distasteful tasks to reduce resentment and hard feelings. -- Ask, "Will you please do this for me" instead of telling someone just to do it. -- Eliminate private secretaries in favor of shared secretaries in order to make it easier to even out the work load. -- If you give employees a basic employee handbook, you will not be interrupted with their questions. -- Pay attention to small details, the big ones are obvious and get taken care of. -- Stay open in your thinking. Be open to all new ideas. Do this and you will not be setting up barriers that do not exist. -- Avoid asking others to do trivial personal items for you. -- Say thank you to those with whom you associate. -- A warm smile and strong handshake break barriers. -- Smile. It helps you feel better and is contagious. The whole organization shudders when the boss is frowning. Likewise it smiles when the boss does. -- Keep things "light" and have fun rather than being too serious. Seriousness blocks productivity. -- In order to fly with the eagles you must "think lightly." -- Work with each person to create standard operating procedures for their specific job. It will eliminate repetitious questions. -- Let people know why they are doing something. It then becomes more meaningful when they recognize their part in a greater vision. -- Provide soft, lively background music not slow and not rock. -- To get a disorganized coffee drinking crew started off more efficiently, begin each day with a 5 to 10 minute meeting just at starting time. They will be focused, set in the right direction and can get right to work. -- Practice the golden rule in business: Do unto others the way you would have them do unto you. Fairness will then be in your business. -- Practice the platinum rule in interpersonal relationships. It is "Do unto others, the way they want to be done unto." They will be more apt to stay comfortable when interacting with us when we are able to do things their preferred way. -- Get others to commit to deadlines by asking, "When can you have that for me?" -- Nail down commitment by asking, "Do I have your word that you will have that for me then?" -- Set the stage for cooperation from others by:1) Introducing the idea; 2) Continual stimulation by talking about it; and 3) get others to make an investment by having them participate in the planning. -- If you are unable to reach agreement or get a commitment from another person in a meeting, agree to disagree, but summarize your understanding in a confirming memo. -- Giving people recognition generates energy within them. They will then direct that energy toward increased productivity. -- Tap the potential of those working for you by giving them opportunities to think things through for themselves instead of just telling them how to do something. -- Always give people the benefit of the doubt. They may not be the cause of a problem. The cause may be beyond their control. -- Admit it when you do not know the answer to a question posed by a staff member. Then challenge the staff person to research and decide what the best answer is. It will help this person grow. -- Be persistent and follow up. -- When you were away and some of your people did an exceptional job, call them at home in the evening when you find out and personally thank them for what they did instead of waiting until the next time you see them. -- If you know that a person will respond angrily to a particular comment, avoid bringing it up. It is nonproductive and bad for the relationship. In other words, "never kick a skunk." -- When you appreciate what someone has done, let them know and put it in writing. This can then be added to their personnel file. -- Have an opinion survey done to determine how people view the organization. That way you can catch any problems while they are still small. -- Encourage periods of uninterrupted activity such as a daily quiet hour in your department or work group. -- When asking someone to do something, let them know what is in it for them and the organization. Do not focus just on what is in it for the organization and yourself. -- The boss is the strongest model the employees have. Be a positive model as people are watching to see how you behave. They will reflect this in their own behavior. Lead by example. -- Be a member of the 4 F club with others. Be seen as Fair, Firm, Friendly and having Foresight. -- Do not help others unless they need and ask for help. -- Encourage your people to come up with new ideas and ways to do things. Give them credit and recognition for the idea. -- If a new idea won't work, at least praise the effort of the person so they will come up with future ideas. -- Once a month meet with each staff member to catch any problems or concerns the person may have as soon as possible before they become a crisis. -- Be the kind of a person that others want to help out and work for. -- Be flexible and do whatever it takes to get the job done. Remember it is results that count, not activities. -- Generally speaking, getting something done perfectly is usually not as important as getting it done. Perfection has a high cost and it may not be worth it. -- When giving or receiving information, don't hurry. Take the time needed to truly understand. It prevents future problems and misunderstandings. -- Whenever you are having an important discussion with a person, before parting, set a specific follow-up date and time and write it in your calendar. -- Never criticize an employee in front of others. Have all discussions of a corrective nature in private.